What a surprise, a plucky young boy hero created by Jeph Loeb, and his name is "Sam." Who ever would have guessed. Sam Alexander searches the galaxy for his father as the Nova Centurion, Nova. Like White Tiger and the Spider-Man/Vulture two-pack, Sam Alexander might as well be a toy based on the Ultimate Spider-Man cartoon. Yes, he's also appeared in the comics, and the stuff about his dad is only from the books, not the show, but design-wise the two are identical, so think of him however you want. Sam was introduced as a 15-year-old living in Arizona; his father was a janitor at his school, but was a drunk who often missed work. He claimed to have been a member of the Nova Corps, but Sam didn't believe him - until the day his father disappeared and Gamora and Rocket Raccoon showed up looking for him. Despite his young age, he's already been a member of the New Warriors, the Avengers, and the Champions (in addition to working with the Guardians of the Galaxy and SHIELD). Nova uses the same teen boy body as Miles Morales and Peter Parker, which probably means we should start a list about it, soon. He's not a straight repaint, though, because quite a few of his costume details are molded elements, rather than simply being painted on. 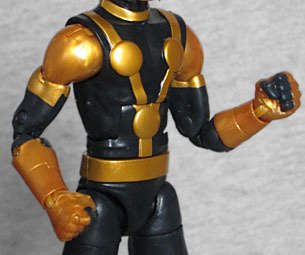 It's just his gauntlets and the pattern on his torso, but that's more than the first Nova got (and much, much less than the second). Rather than the traditional gold helmet, Sam wears his father's black one. Jesse Alexander was a member of the Supernovas, a six-being black ops team for the Nova Corps - think of the way Wolverine's X-Force related to the X-Men, and you'll get the idea. The toy is dark blue rather than black, however, which seems like a pretty blatant mistake to make. The kid has a balljointed head, hinged neck, swivel/hinge shoulders, swivel biceps, double-hinged elbows, swivel/hinge wrists, hinged torso, swivel waist, balljointed hips, swivel thighs, double-hinged knees, and swivel/hinged ankles. It's a good amount, but moving the chest hinge at all breaks the lines of his costume - and since the same pattern is present on both the front and the back, it happens no matter which way you bend him. 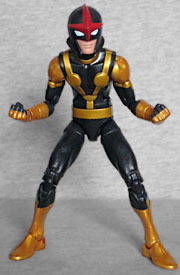 The figure has no alternate hands, no alternate head, and no accessories. He does, however, come with a pack-in: it's Phlish, another member of the Supernovas! He's just a little blob of clear protoplasm with a few black strips of armor on its surface and a red Nova Corps crest around its "eye." This is just a cute little thing to include with Nova, even though the two of them never met. And at just a bit over ¾" tall, Phlish is the smallest Marvel Legend ever released - yes, even Baby Groot towers over him! 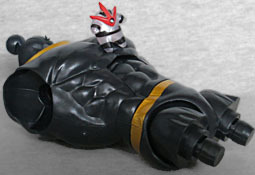 Since Nova and Phlish are so small, we get the biggest piece of this series' Build-A-Figure, Titus. It's the entire torso, from neck to hips, and it alone is about as big as Sam. Despite being a new character, Sam Alexander has proven pretty popular. He's been on a couple cartoons and a few high-profile teams, so you really have options where you want to display him. With Peter Parker and Ava Ayala? With Scott Summers, Miles Morales and Kamala Khan? The kid gets around! Other than the paint color, Hasbro did a nice job on his inaugural action figure.